This flag is rare and special for many reasons. The flag dates to Washington statehood in 1889. An unofficial star count, it only lasted for 243 days from November 11, 1889 until the introduction of Idaho on July 3, 1890. The flag's construction is beautiful and unique among surviving examples of 42 star flags. The silk of the flag is brittle, but the flag itself is remarkably intact. The deep blue of the canton provides stark contrast to the bright gold painted stars. The stars in the medallions are compact and carefully aligned so that one tip points to the center of the next star in the wreath. Each arm of the stars is highlighted with a highlighting paint to make them stand out even more. Close inspection reveals that the flag initially began as a 38 star flag produced prior to November 2, 1889, when North Dakota (38) and South Dakota (39) were admitted to the Union. The maker of the flag added the four center stars that flank the central star in order to update the count to 42. The gilt of the four added stars is slightly brighter, and the accenting paint along the arms of the added stars are a different shade of yellow-green than that of the original 38 stars. The maroon-red and cream-white coloration of the stripes is particularly beautiful, well complementing the dark royal blue canton and gold stars. 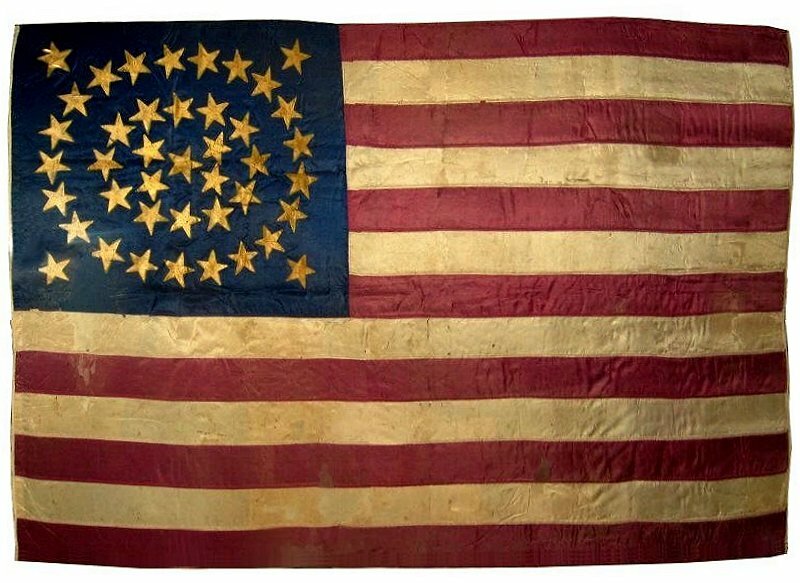 The use of the flag is unknown, though its form, with gold painted stars on silk, is generally indicative of a military usage. In its day, this kind of construction and the materials used to make the flag were the most expensive of any kind of manufactured American flag. It is a small flag, at just two feet on the hoist by three feet on the fly. It may have been used as a military standard by active units in the American West during the Indian Wars, or as a ceremonial flag for a veteran unit from the Civil War. 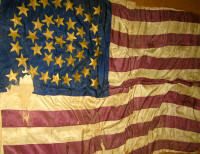 Although the weighted silk of the flag is now brittle, great care has been taken to preserve the flag. Some areas of loss have been backed with matching colored silks, and the flag has been carefully pressure-mounted to prevent further damage or deterioration. It remains in a remarkably intact state and is beautiful to behold. Learn more about how Americans update flags with more stars.